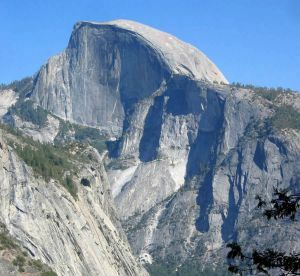 The Half Dome is dramatic polished granite dome that hovers over the east end of Yosemite Valley. The northwest face is a vertical wall with several classic big wall routes. The southeast face is also very steep. An exposed "trail" along the northeast ridge, with fixed steel cables for protection, leads to the summit.